The finish on any grill or smoker will deteriorate due to sitting out in the sun, weathering the winter, and the wear and tear of use. If your grill or smoker is looking bad, you might need to give it a fresh coat of paint to bring it back to its old appearance. Or, it may simply need a good cleaning to remove oxidation. The first step is determining if your grill needs to be repainted. Stainless steel grills and most enamel-coated grills (like the Weber Genesis Series) don't need to be repainted. Black painted grills can be painted, but it might be that your grill only needs a good cleaning and not a complete paint job. The number one enemy of the black painted grill is not rust, it is oxidization. If your grill has a dull, ashy look to it, you might have an oxidization problem. This might not mean that you need to repaint your grill. Try washing your grill thoroughly with a kitchen detergent and warm water. Avoid anything too abrasive or you will scratch the finish and need to repaint your grill rather than just cleaning it. Once the surface has dried, lightly coat the affected areas with cooking oil. This will help seal the surface and restore the appearance of your grill or smoker. If you are faced with a paint job, then it is best to do the entire body of the grill. You will need a good wire brush or steel wool, metal sandpaper, and barbecue paint. Paint for grills and smokers need to be heat resistant and capable of withstanding temperatures above 500 F (260 C). Some people use engine paint on their grills, but you shouldn't have any trouble finding paint specifically made for grills. Start by cleaning your grill well as any grease on your grill will repel paint. You can use oven cleaner to degrease the grill. Oven cleaner is bad for the paint job, but since you are doing this step just prior to painting that isn't a concern. Note that you can disassemble your grill to make the painting easier. You are not going to be painting the interior, but you don't want paint getting inside to your burners. Using a wire brush or steel wool, scrub down the surface. Once you have it cleaned you will want to go over it with sandpaper to get after any rusted areas. Most types of grills are made from cast aluminum and won't rust, but most smokers are steel and will rust (badly) once the paint has worn off. Any rust left on the surface of your smoker will continue to eat through the metal, even with a coat of paint on it. Getting down to the base metal will eliminate this problem. You don't need to get every bit of paint off, just make sure that the surface is free of rust, clean, and smooth. Now you are ready to paint. The first rule of painting anything is to be patient. You should plan on a couple of thin coats and not one heavy coat. Several thin coats will be more even, look better, and last longer. Let the paint dry completely between coats. Once your painting is done and completely dry, fire up your grill or smoker to a high temperature. This will cure the paint and make it good for smoking. Repeated paintings over several months or years will make your grill or smoker even more impervious to rust. Take good care of your equipment and it will serve you for a very long time. 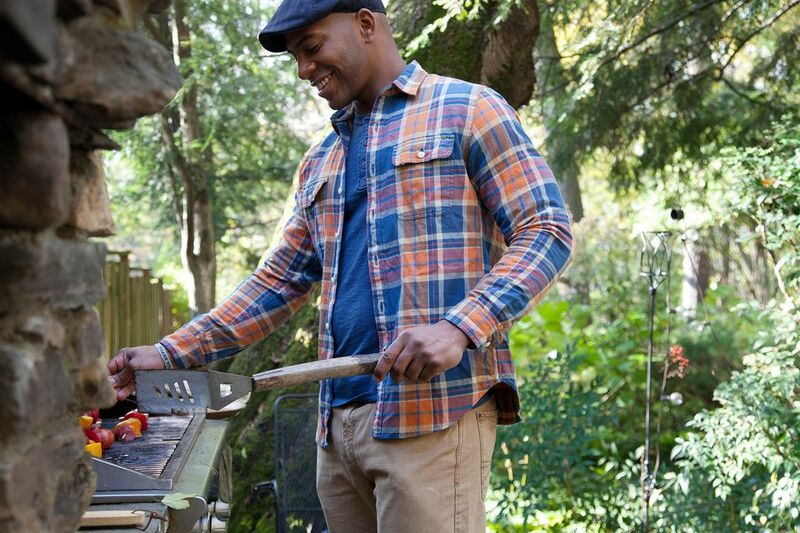 What Kind of Grill Should You Buy, Gas, Charcoal, Electric, or Pellet?